It's here! 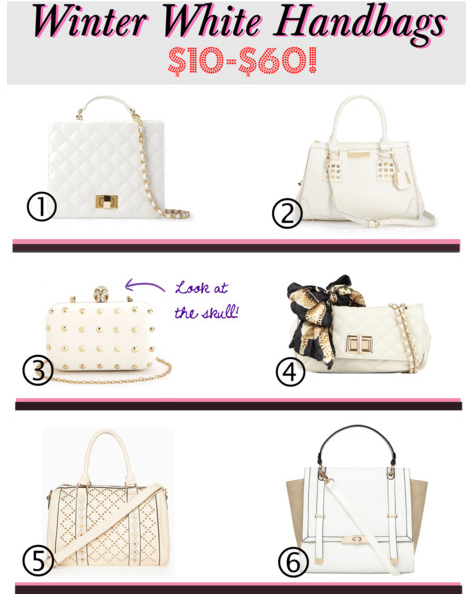 Part 2/3 of the Affordable Winter Handbag Series! Winter white is my favorite handbag color when it gets cold out. It goes so well with all of the holiday sweaters, mugs, scarves and mittens we wear! You don't have to worry about changing your handbag to match your outfit so it makes getting ready a lot easier! Especially when you have to focus on shopping for gifts! So, to get you prepared for this coming season, here's an easy way to get your winter handbag out of the way. Here are some of my favorite winter whites! Starting at $9.99! I'm serious! Retail Information: Click on links to go their retailers! Btw, have any of you been to the mall lately? I went yesterday and wow it was packed! I also thought it was funny that they played....get this...Backstreet Boys music in between Christmas songs at the food court. I was like "Who came up with this mix? Seriously?!" But needless to say, I got some great deals. H&M has sweaters this weekend for buy 1 get 1 free! Plus an extra 10% off when you text for it at the checkout counter. And H&M sweaters are not the cheapest around! So I freaked out at that deal. I'll post a picture later as my proof. Express also seemed to have an awesome deal, but I didn't have time to go in and check it out! So...heads up with that as well!